Open only on Sundays and Wednesdays, we went shopping at the flea market known for its antiques and stolen goods and found these things all within a budget of INR 2000. Bring your A-game in bargaining and check them out! Nothing screams antique more than the dull golden sheen of a gramophone. What was an innovation on how people could listen to music is now on every antique collector’s list of must-own teams. 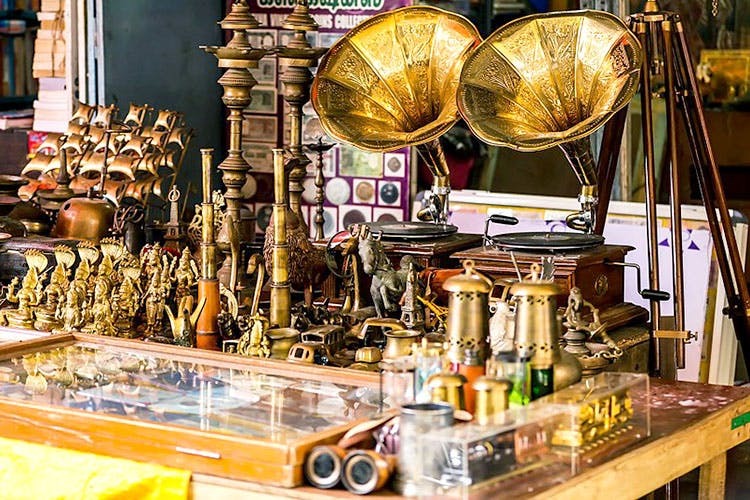 These gramophones at Juna Bazaar start for as cheap as INR 500, depending on how old it is and the condition it is in. You can even find vinyl records that can be played on them at these stalls. Who said door knobs cannot be decorative? Yes, you heard us right. These door knobs have a variety of designs in popping colours that are sure to catch anybody’s attention as they open the door. They start for prices as low as INR 150. In an age where sleek and slim is the trend, these bulky wooden boxes still hold their own, reminding us just exactly why we are obsessed with owning antiques and preserving their charm. Prices start around INR 500 and your bargaining skills will definitely come in handy here. The furniture here is worth checking out and though it may be old, it’ll breathe a new life into your interiors. A small study desk and table would cost you just INR 400 while you can even get small wardrobes from prices starting INR 500.